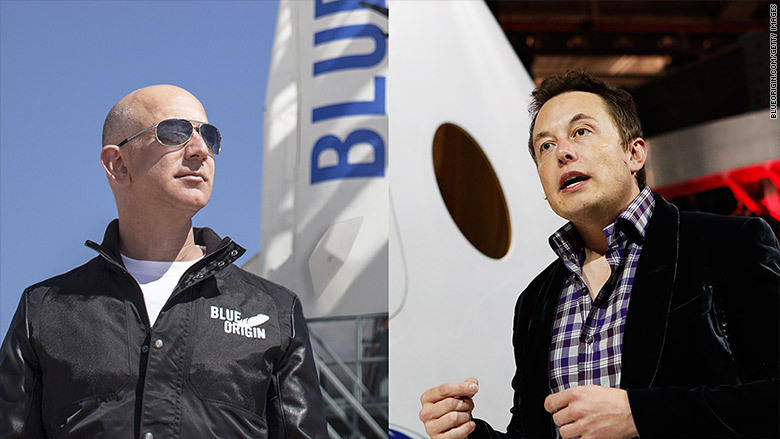 In a 10-day stretch, Jeff Bezos and Elon Musk have made something abundantly clear: They're competing in a world of their own. 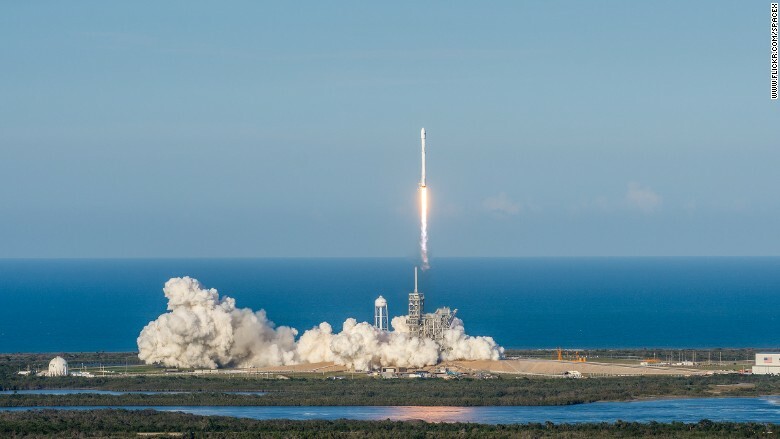 Bezos, the Amazon CEO, and Musk, the Tesla and SpaceX CEO, have distinguished themselves as the must-watch innovators pushing hardest -- and most effectively -- to bring the future to us today. They made billions in the Internet age, like many in the tech world. But Musk and Bezos' innovations aren't limited to the screens we stare at all day. They're catching the next tech wave, as the Internet overruns the physical world, whether it's cars, rockets or supermarkets. Amazon (AMZN), not content with dominating e-commerce, announces two grocery stores in Seattle, where Amazon Prime members can pick up their groceries at a drive-through. It's a reminder of the company's interest in reinventing the grocery store experience, a huge potential market that could push Amazon toward being the first $1 trillion company. Amazon's stock closes at an all-time high. Meanwhile, Musk promises details shortly on a new side project, Neuralink, that will merge human brains with computers, essentially making humans into cyborgs. Amazon stock closes at another record high, and Bezos passes investor Warren Buffett to become the second richest person on the planet. Musk's SpaceX makes history -- successfully launching a used rocket into space. The feat is a critical milestone toward reducing space travel costs and making it feasible for humans to live and work outside of Earth. Never satisfied, he immediately proposes a new goal -- re-flying a used rocket within 24 hours of its landing. Tesla (TSLA) stock surges on improving sales, passing Ford in value. While Tesla sales are a drop in the bucket compared to Ford's (F), investors realize Musk is positioned to win big as automobiles become electric and self-driving. Musk pokes fun of the investors who have bet against him. "Stormy weather in Shortville," he tweets. Meanwhile, traditional retailers appear out of their league as consumers shift online, to places such as Amazon. Urban Outfitters (URBN) announced declining sales, the latest bad news for a falling stock. More retailers admit they're struggling in the era of Amazon e-commerce. Staples (SPLS) is reportedly exploring selling itself. Ralph Lauren (RL) announces cost-cutting moves including closing its Polo store on Manhattan's 5th Avenue. Payless ShoeSource announces it's filing for bankruptcy. Amazon stock closes at a record high, worth nearly twice as much as Wal-Mart (WMT). At a space conference in Colorado, Bezos unveils a crew capsule with huge windows from his rocket company, Blue Origin. He also reveals he's going to sell $1 billion in Amazon stock each year to finance Blue Origin. Amazon stock moves toward a record high for a sixth straight day. The company reminds us of its vast ambitions, cutting a deal with the NFL to stream its Thursday games to Prime members. The Wall Street Journal reports that General Electric (GE) is selling its light bulb business. The company of Thomas Edison doesn't have an equivalent innovator at its helm. This marks a changing-of-the-guard moment. The Edisons of today appear to be leading Amazon, SpaceX and Tesla (TSLA). 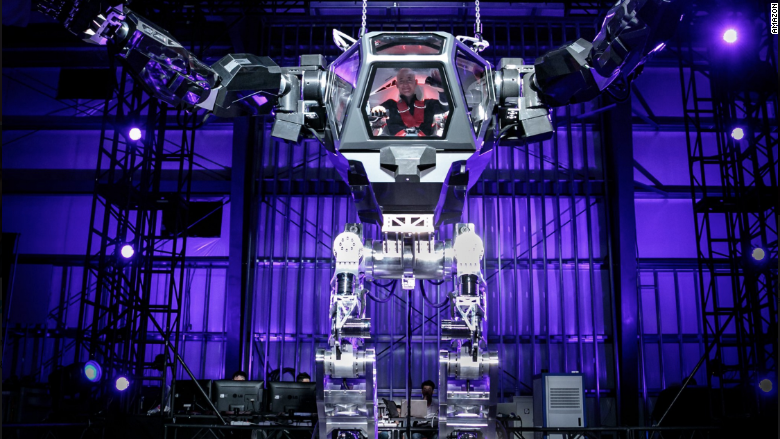 Jeff Bezos controls a massive robot from Hankook Mirae Technology at his company's annual robotics conference this March. Amazon announces it's offering 30,000 new part-time jobs over the next year. That's on top of the 100,000 full-time jobs it's already planned for the U.S. over the next 18 months. Meanwhile, the hyperloop transportation concept that Musk floated in 2013 takes a step toward fruition. Hyperloop One proposes routes around the United States, promising speedy travel for cheap prices. Musk and Bezos are on a hot streak, but there are sure to be setbacks. Taking on lofty, seemingly unattainable goals has been critical to their success. "Failure and invention are inseparable twins," Bezos wrote last year to shareholders. "We all know that if you swing for the fences, you're going to strike out a lot, but you're also going to hit some home runs." An earlier version of this story misstated when Payless ShoeSource announced its bankruptcy. Payless announced the news on April 4, not the 5th.